Comments: Palmlike flowering tree native to Southeastern Mexico. Usually sold as an indoor plant, this species will do well outdoors in our climate provided the soil has good drainage. 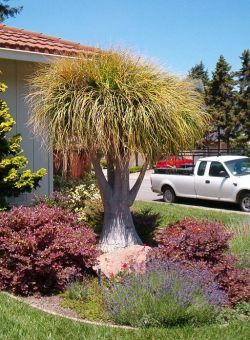 Frost and cold tolerant as well as drought resistant, this species can eventually attain 20' in height. Flowers are creamy white but don't appear until the plant is 20 years old.